The word Monk means alone: it was given in the early Church to Christians who lived far from the commerce of men, to be particularly sacred to God; several of these Monks, being united, lived under the government of a Superior, at which time they were no longer truly Monks; while the Benedictines and those who live in Abbeys, having kept this denomination, they are called Religious Men. Their dress consists of a Tunic and a Hood, the dress most conformed to the voluntary humility of their state. 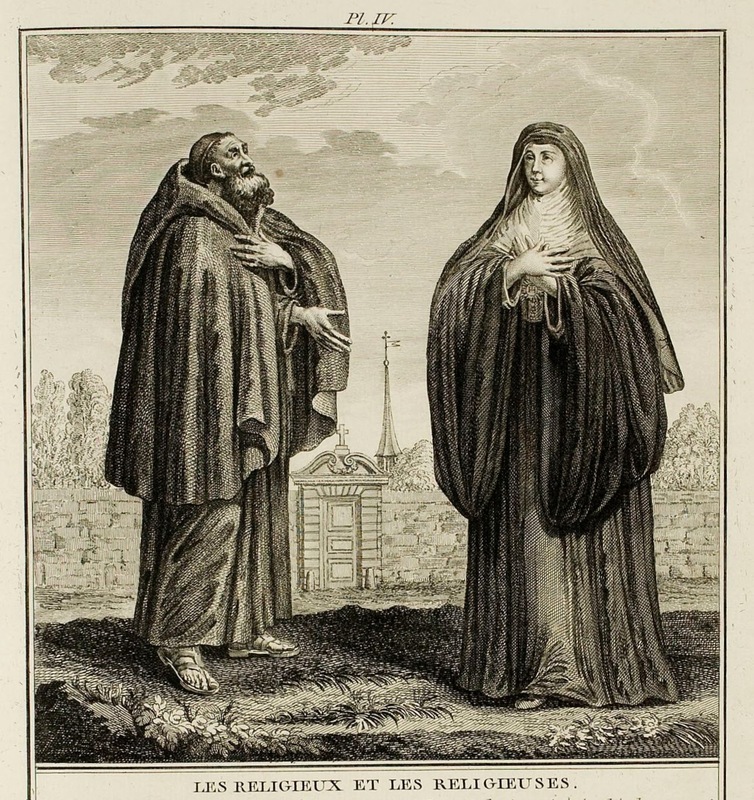 The Capuchins were not very removed from this manner of dress, as can be seen in the figure represented here: they are dressed in a large gown, a cloak, and a hood of a thick grey cloth; they have sandals, wear a beard and a crown of hair. Religious Men possess nothing, they live only on alms; Cloisters used to be protected in men's Monasteries, which had a hospice to receive strangers, in which secular people were allowed to go, but the prohibition has still persisted for women. The name Religious Woman is given to a girl or widow who professes to live in the monastic state. There are different orders; the principal orders of religious women are the Dominicans, the Poor Clares, the Augustinians. The one that we have represented here is of the rule of St. Benoit, which has a dress similar to the Benedictines, and is devoted to the perpetual adoration of the St. Sacrement. What principally distinguishes Religious Women from Religious Men is the cloister: they are enclosed by walls, doors, and grilles that prevent them from passing, and the interior of which strangers cannot enter without the permission of a superior Ecclesiastic. The vow of perpetual cloister is essential to their state, however, it is permitted for them, mainly Abbesses and Superiors, to leave for good reasons and with dispensations, when it is necessary for the reestablishment of their health, for the good of the House, etc. etc.